On the 35th day in the life of the most beautiful girl in the history of the world the morning began peacefully. I brought Maya out from our bedroom to the living room and opened up the shades. She had an apnea at 4:30 and Erin had held her for the rest of the night. Krissie came over at 8:00 to help us through those early morning sleepy hours. We watched sports center together on the couch. She is getting quite opinionated about her sports. We discussed how long it would be before Auburn had to forfeit their championship. At about 9:00 she started getting grumpy. A wiggle progressed to a squirm which progressed to small cries which led to bigger check out my new lung capacity crying spree. I tried every thing to soothe her. Maybe her legs were bundled to tight. No that wasn’t it. Maybe she needed a diaper change. Nope still not it. Lets try a new position. Nada. 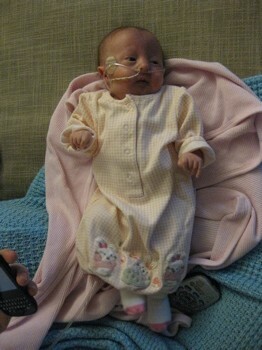 By this time Erin had heard her cries and had come out to check on her. Or maybe to check on me it’s hard to say. I told her that I had tried everything and she must just be gassy. Erin sat down on the couch and held her. Maya did not make even a peep from the moment she was in her Moms arms. What I thought was gas was just a need to be close to her mommy. I didn’t mind one bit. I love seeing the two of them cuddled up. They even managed to nap a little bit together. It was one of those special moments that seem so small when written down but really is what being a parent is all about. It was a wonderful moment and one I will always remember. But as is life the magic was fleeting. At 9:30 Maya had her second apnea of the day. We held her and comforted her the best that we could. After four minutes of strugling she regain her regular breathing pattern. After an apnea Maya goes to sleep. She needs her rest and her struggles wear her out. She slept for a while, and then woke up acting like nothing had happened. That’s kind of her pattern. It is one we have gotten way too familiar with over the last month. In the afternoon Maya had a visit from her nurse and a occupational therapist. We learned some exersizes to help her loosen up her hands and her hips. She responds well to the stretching. We can really see her progress with her hands. When she was born her hands were so tight she could barely open them. Now she often lifts her pointer or index finger to her mouth doing her version of a Dr. Evil impression. Tonight Grandpa Bob and Grandma Chris came over to see Maya. 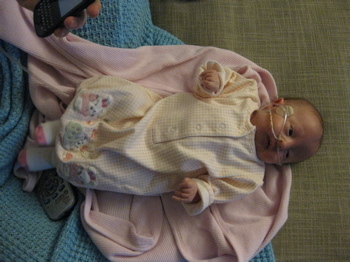 Shortly after they got here Maya had her 3rd apnea of the day. It was very similar to the previous two. She has pulled out of it and is now resting in Grandma Chris’ arms. As I look over apparently Grandma Chris is resting to. 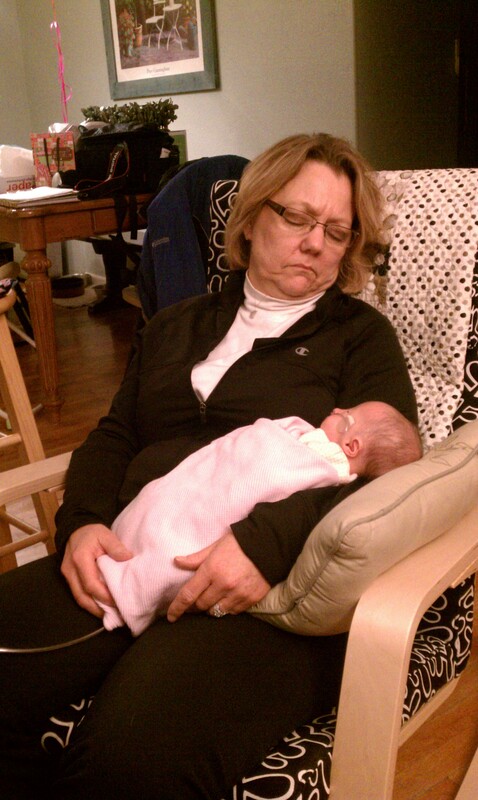 I guess it is hard to be a grandparent. They seem to need to take naps too. We had an excellent dinner delivered from South Dakota. Jan and Doug sent us some amazing Dean and Deluca. It is amazing how much little things from other people have lifted us up over the past month. These little things have had a huge impact on my family. We have gotten such an incredible response from so many people. Many of which have never been able to meet Maya. Our community has rallied around our little baby girl and the love that they have shown us we be held in our hearts for a long time.